Find contest below my review. I ‘met’ George Jackson in a Facebook group called Mystery Most Cozy. Always boosting other peoples’ posts, very encouraging and welcoming to new people. Almost never mentioned his own books. Which is rare. The world of publishing is changed and authors must be aggressive self promoters these days. So the less he promoted, the more curious I became. Finally I decided to read one of his books. Then I sent George a message that started: “So George, you are like the only person who hasn’t asked to have your book(s) reviewed. A clever ploy on your part? Get me thinking why is this person the only person on the planet not bugging me – seriously I get requests from people in countries I have never even heard of. So the ploy worked.” Well it wasn’t a ploy, George is just a very nice guy and as I am totally hooked on his books, I am very happy to have him here today. George Jackson (middle name William) was born November 25, 1947 in a small town (Fair Haven) in the Green Mountains of Vermont. He earned a Bachelor’s in Education and a Master’s in Leadership and Administration from Castleton State College. 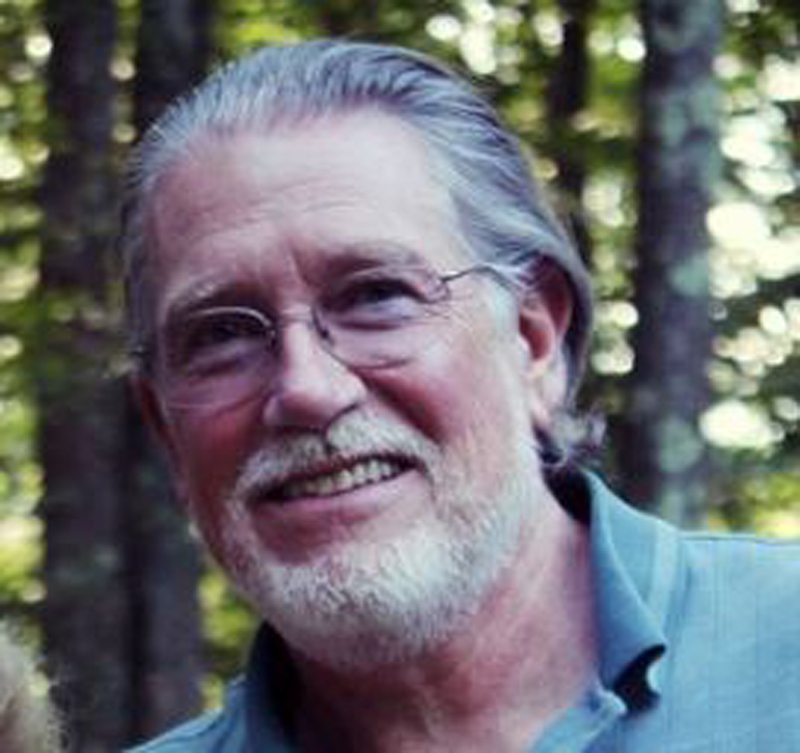 He spent 40 years in education as a teacher (11 years) and a principal (29 years) in both Vermont and New Mexico. He and his wife Carolyn, who taught for 30 years, have five children, eight grandchildren and three great grandchildren in their combined family. He is also an artist in oils and loves reading, video games, fishing and the ocean. George and his wife now live in Tradition, Florida. Besides THE FALLS series he writes dragonrider fantasies and humorous short stories about kids and schools. He has even written a children’s book, The Twilight Tea Party, also at the Kindle store. Welcome, George. 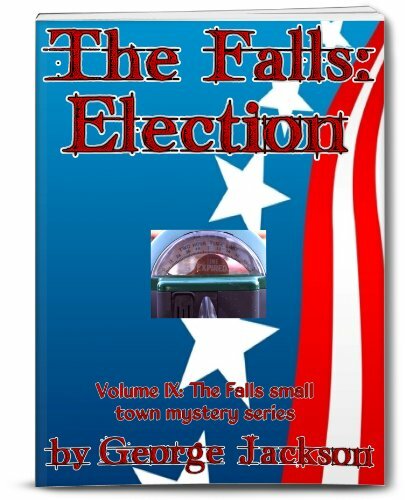 You have put out a lot of books in The Falls series in a very short time. Have you been writing it for years and just finally decided to publish them or are you just a very prolific writer in your retirement? First of all, it’s great to be here with you Kate. More importantly than this opportunity, I appreciate your friendship and your tips to help me get started in this wide new world of publishing that’s out there! Now, to answer your question: I have been writing since the world was young. I made up stories in my head as a kid, and industriously penned numerous short stories when I was a teenager and in my twenties. Then I started a dragonrider fantasy series (now listed as The Dragon World Series at the Kindle Store on Amazon.com) when I was working as a principal. Perhaps that was a ‘get away from the stress’ issue as well as a ‘need to write’ issue! 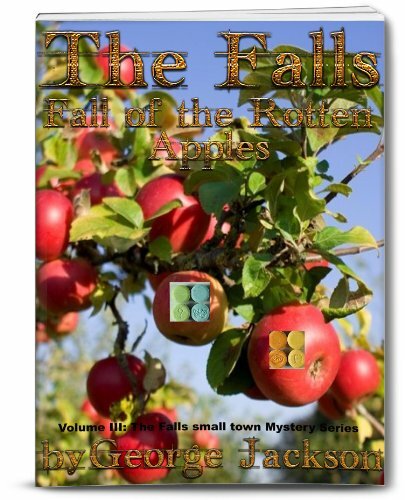 The Falls small town mystery series was started back in 2009 right after I retired. I had always wanted to write full time and I finally got my chance. I spent two and a half years aggressively trying to get an agent to sign me up. They always told me they liked my work, but that I didn’t fit the ‘mold’ they had to fill at that moment. Since 2009, I write two hours or so almost every day in the morning and edit two hours in the afternoon, usually working on two different books, or two different series (which is quite a mind twisting assignment at times!). Of course that doesn’t count time spent on FB or making covers. Belonging to several writers’ groups on Facebook has helped me, as a writer, feel less isolated. That’s important for any author. Where did the name West Sugar Shack Falls come from? The sugar shacks in the maple industry, Sugar Shack Falls in Canada, or were you just a big fan of Jimmy Gilmer? I’m a Vermont boy, Kate! Born and bred! Sugar shacks dotted the Vermont landscape back when I was a kid. My grandfather even had one at his farm. I was even principal at a school once that had one. The sight of a farmer and his son tromping along from maple tree to maple tree to empty tin sap pails, an old work horse pulling the sap collector along in the snow, was commonplace. Making maple syrup and maple candy is a time honored Vermont tradition. Besides, West Sugar Shack Falls just sounded homey. It’s a comfortable, caring little place where the values of truth, honesty, community spirit and kindness come first. My books, as you’ve stated, are first and foremost about a town, the inhabitants and their ever growing relationships. Clearly you put a lot of yourself and your experiences in the books. And readers are always trying to find what character in a book is really the author. But I can’t find any one character that is George. I suspect the protagonist, Cash, has many of your qualities. But William is a writer, Sean is a principal, there are several video gamers, and Drake has his ‘Dragon’ and seems to look like you. So where in the world is George? I bow to your wisdom and accurate perceptions, Kate! I plead guilty to bits of me being in each of the characters you’ve mentioned. They each have parts of this humble Scotsman, or I would like to think so anyway. What better person than yourself to use as a model for your characters? It’s the person an author knows best and can dig deepest into. I’m impressed with your insight…and just a tad embarrassed. Finding bits of me in so many characters makes me sound a bit conceited, which I hope I’m not. The scene between Shep and Daniel was heart wrenching. And Beth’s funeral – that had to be something you experienced to get the Jewish, Christian mix just right. Was it real? In my almost sixty-six years, I have unfortunately seen my share of funerals and tragedies. The feelings and emotions of each cross ethnicity and religious lines. I did a bit of research to keep it accurate, naturally. I have lost friends and relatives of every religious affiliation, and in every case, the essence of those last ceremonies is the same: paying tribute to and celebrating the life of the deceased and helping the families and friends to make their peace and move on afterwards. I hope that came across in those scenes. I love how kids are so much a part of the series. They are just there, a part of things – like in real life. Most mysteries, unless they are young adult oriented, have children there like they were furniture or something. Was it a conscious decision on your part or did it just come naturally from so many years in education? I never gave it a thought, it just came naturally. Children are necessary to me, especially in a series. Forty years in education, five children, eight grandchildren and now working on the greatgrand babies. So to me, you need children. You need to see them grow and blossom, and watch the roads they head down. It’s an essential part of the series to me. You notice that the series started out with Jeremy Burman as a middle schooler and now he’s in college, still a part of the whole. His character has helped to tie together a number of pieces and plots within The Falls. As you said so eloquently in your introduction, my stories are small town mysteries even before they are cozy. You’ve just put out the twelfth book in The Falls series, THE FALLS: REVENGE. How long before the next one and any hints for us what it will be about? As I write this, The Falls: Revenge should be out within a few days. (IT IS NOW OUT.) The Falls: Revenge deals with CR Shanks, the private eye who has recently become the long, lanky sweetheart of Dr. Meg Monroe. He is being targeted by someone who holds a secret grudge. Someone who will stop at nothing to get their revenge. There are, of course, some sidestories and the usual colorful characters. The book I’ve just started working on, The Falls: Thanksgiving, will be a work in progress for the next couple of months. I hope to have it out before Christmas…with Santa’s and Grandma Mina’s help! We’ll see! I plead immaculate ignorance, Kate! I write in WORD (the latest edition now that I’ve switched to an iMac from an HP touchscreen) and change it into HTML before heading over to KDP. Whatever their process does to a downloaded manuscript, it works well for me. I use Courier New 12 point type. I use myecovermaker.com for covers with pictures from stockexchange and my own photographs at times. I draw much of the artwork for my dragonrider novels. Sorry I can’t be more help! What is your favorite food? Spaghetti and sausages, or steak and homefries, or High English Tea with scones and clotted cream! How’s that for a mix? What is your favorite TV show? NCIS, Elementary, The Big Bang Theory, Covert Affairs, NCIS: Los Angeles and a host of others. What is your favorite music? I love old time rock and roll, Scottish and Irish melodies, and bagpipes speak to my soul. Thank you so much for being here today George, and good luck with your new book. And since you are from New England originally, I hope you will come up for a vacation that will include visiting New England Crime Bake in 2014. Before you go, is there anything else you would like to tell your readers or have them know about you? Thank you for your kindness and thoughtfulness in having me with you today, Kate. I simply hope that people enjoy the books and find a laugh, a tear, and their hearts and souls warmed just a bit as they read them. For my readers, Thank you, for making my aspiration of being an author come true. By reading my books, you keep my dreams and imagination alive! Come visit The Falls! Whole series review, not just one book. I will include the blurbs with links for all the books in the series below. 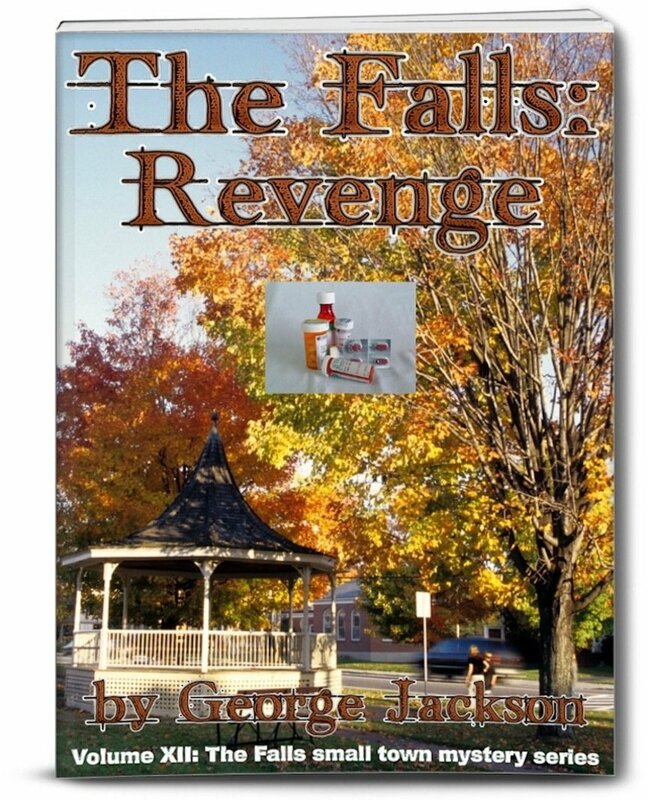 George is giving away a Kindle copy of THE FALLS: REVENGE. For a chance to win, just leave a comment below. For additional chances to win, click HERE. 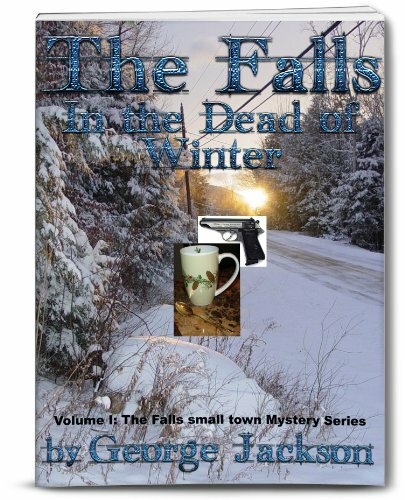 THE FALLS: IN THE DEAD OF WINTER (1) West Sugar Shack Falls is a small town in Vermont. The sheriff, Cash Green and his deputies, Ericka Yamato and Horace Scofield pride themselves on watching over their colorful cast of community members. But one frosty, snowy night in January, murder comes to The Falls. As the snow falls over the next few days, the bodies mount up! Join in with the downhome humor, the lovable (and destestable!) characters you meet and try and figure out “who dunit“. The end is all action, involving a professional hitman, battling funeral directors, some nefarious community members and an exciting romp in the snow banks and freezing weather of New England. The story ranges from heartwarming to humorous to rugged action. This is the first of many Falls novels. Welcome to The Falls! THE FALLS: SUMMER NIGHTMARE (2) Welcome back to The Falls! In this, the second volume of the series, there are several new characters introduced including the stunningly beautiful and elegant new psychiatrist and the witty, pretty, and caring new doctor for the hospital. Camp Moonrise, the children’s campsite on the west shore of Lake Pumpkinseed and the summer rental cabins on the east side of the lake provide several new storylines as well. But the main story has all the twists and turns of a nightmare rollercoaster! It’s summer in The Falls so bring a cool lemonade and some bug spray! 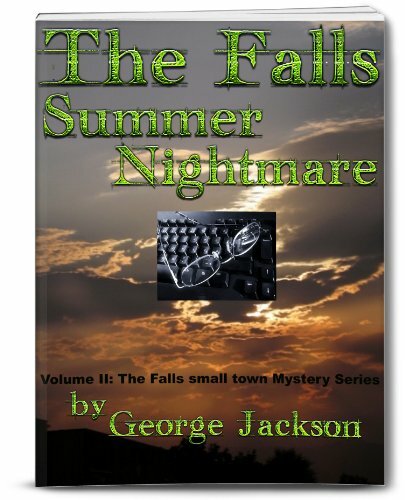 Follow Cash Green, Doc Stone and the memorable citizens of The Falls as the summer and the murders heat up! THE FALLS: MUD SEASON (4) It’s mud season in Vermont and a busload of school kids have found a dead body encased in it! Welcome back to The Falls! There are several new characters, and all the old familiar ones you’ve come to know and enjoy. Visit Dream Rides: Where the Adventure of a Lifetime Begins! Come and have tea with Ducks and Puddles, stop by the Whitfield Family Compound and buy a painting from charming Louisa May McFadden. Follow Sheriff Cash Green, Deputies Ericka Yamato and Horace Scofield, Doc Stone and Meg Monroe as they work together to find out “who dunit“. Revisit The Falls during the fifth season of the year, and try not to get stuck in the mud! 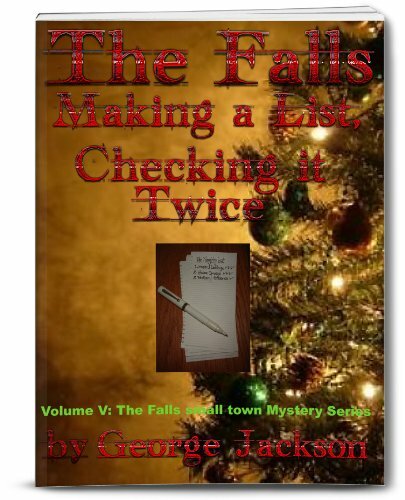 THE FALLS: MAKING A LIST, CHECKING IT TWICE (5) It’s Christmas time in The Falls. The town is just getting ready to welcome in the joy, love and warmth of the season, when a local petty criminal is found shot to death in a stand of Christmas trees! Follow Sheriff Cash Green, Deputy Ericka Yamato, Doc Stone, and Dr. Meg Monroe as they set about to find out who is using a Naughty List to bring some vigilantee justice to The Falls! Join Sean Frasier, his brother William and Dr, Serafina as they help track down the guilty party. Lots of Christmas cheer, small town interactions and a puzzling “who dunit“. Welcome back to The Falls! 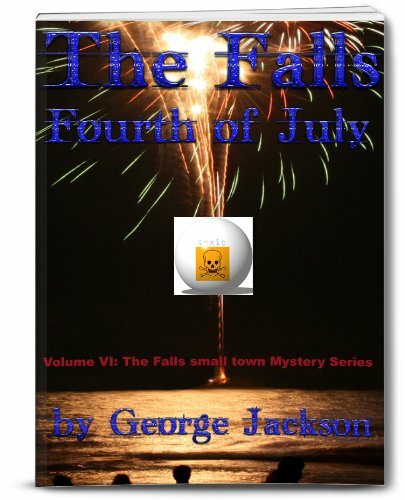 THE FALLS: FOURTH OF JULY (6) It’s the Fourth of July and a body is discovered in a pasture while a flag football game is in progress. 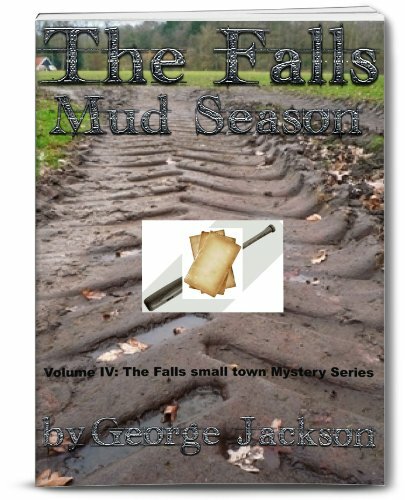 Return to The Falls for several twists and turns in the search for the murderer. Squashy makes a dramatic appearance in Lake Pumpkinseed and a scientific research team is dispatched to find out what really is at the bottom of the lake. As the Vermont summer sizzles, follow Sheriff Cash Green, Deputy Ericka Yamato, Doc Stone and Meg Monroe as they search for clues to find the killer! Grab a lemonade, pull up a beach chair and return to The Falls! THE FALLS: CUPID’S ARROW (7) It’s Valentine’s Day in The Falls. Someone is using a bow and arrow to settle their differences, and it isn’t Cupid. Watch the twists and turns in the plot as you follow Sheriff Cash Green, Deputy Ericka Yamato, Doc Stone and Meg Monroe as they search for the clues to find out “who dunit“. Lots of colorful characters, down home humor, and small town scenarios. Fast paced action blends with humor and relationships around the community. Grab a Valentine and a chocolate or two as you come back and visit The Falls! THE FALLS: MAY FLOWERS (8) Jeb and Zeke have built a world class fitness and wellness center to enhance the lifestyle of the town’s citizens! Everything is wonderful, but then, one morning, Horace Scofield’s wife, Millie, drags her kids into the exercise room to get in her workout before she sends them off to school. There, lying limp on an exercise bench is one of the new trainers, a three hundred pound barbell across his neck! 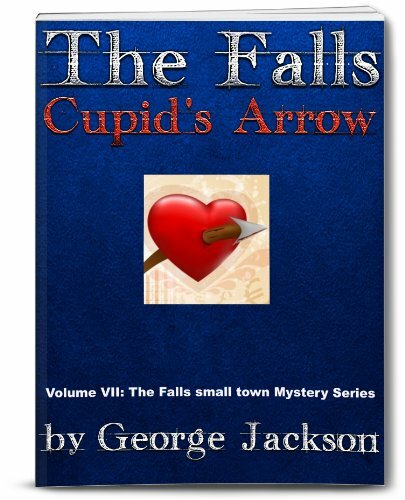 Visit The Falls as Sheriff Cash Green and his deputies search for the killer. A crime syndicate from the Jersey Shore, a seacoast city in Africa, and the roving reporters from WCAX all play major roles in the plot! Come and visit The Falls as the flowers, shrubs and trees bloom and the citizens of The Falls carry on with their lives. Come re-visit The Falls as April showers bring May flowers! THE FALLS: ELECTION (9) It’s Town Meeting in The Falls! With the retirement of two of the three members of the Board of Selectmen, this year’s election is about to provide a good deal more suspense, twists and turns than normal! Throw in the fiery disagreement over parking meters, and the death of the town meter maid and Town Meeting’s going to get a little hot! Return to The Falls with Sheriff Cash Green, Deputies Ericka Yamato and Horace Scofield, the Frasier brothers, Doc Stone and Meg Monroe! Set in Vermont, as the cold March winds start to blow and the Yankee politics heat up! Grab a cup of Earl Grey and settle down to return to The Falls! THE FALLS: THE TRIAL (10) Mona Castillo’s in danger of losing her home and her beautiful art gallery to an arrogant, aggressive southern belle! Not only that, but a gang of international thieves had become active in The Falls! Follow Sheriff Cash Green, Deputies Ericka Yamato and Horace Scofield as they, Doc Stone and Meg Monroe work to solve all the mysteries cropping up around town. 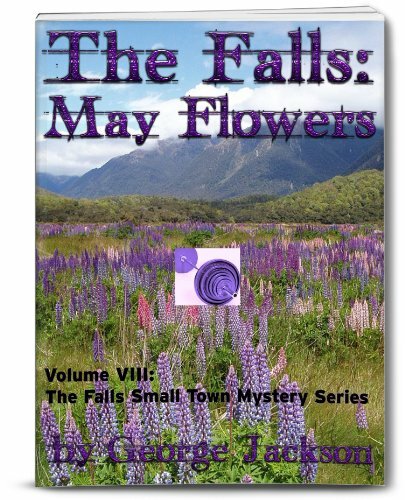 Find out more about Yamato’s biological parents and grandparents and follow the charming, amusing and outlandish community members around town as the tenth book of The Falls small town mystery series comes to life. It’s June, and the Vermont summer is settling in, so grab a lemonade and return to The Falls! THE FALLS: RETURN (11) Caleb LePaige is back! The brutal, calculating master criminal has escaped from the maximum security prison where he was placed after trying to kill Grandma Mina and has returned to The Falls.Chasing after him comes the prison’s arrogant warden, Malcolm Strasberg and his cold-blooded second in command, Hans Bergdorf. Hold your breath while Sheriff Cash Green confronts his number one nemesis while trying to deal with the egocentric, cruel warden. Yamato’s grandparents visit, Jeremy Burman prepares to leave for college and his cousin Parnell tries to land Jeremy’s old job in the library with Miss Eunice. Put on your flak jacket and return to The Falls for all the excitement! 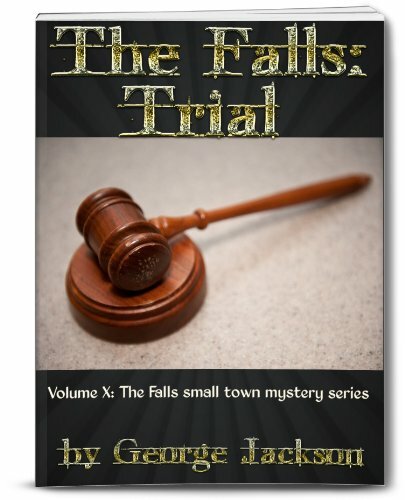 Come back to The Falls for the 11th book in The Falls small town mystery series! 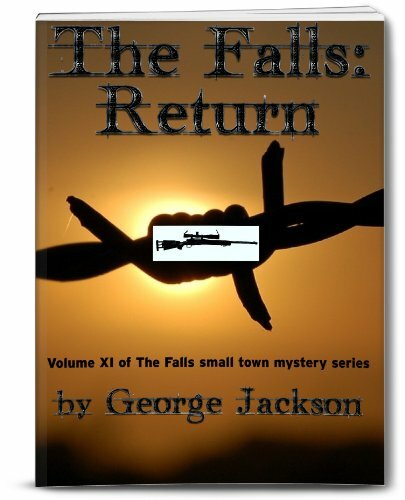 THE FALLS: REVENGE (12) The Falls: Revenge (the 12th volume of The Falls small town mystery series) is a story of payback. CR Shanks is a private eye and Meg Monroe’s sweetheart. Someone has a bone to pick with CR and they will stop at nothing until they get what they want! Several side stories, including Jeremy and Sylvia Jean’s first year away at college, and the usual colorful and outrageous characters are all packed into a few days in September in small town Vermont. Return to The Falls! This is one of the most intelligent interviews I think I have read in a long time. Mr. Jackson’s answers are well thought out and well written. Thank you. And thank you, Kate, for introducing George Jackson to me. Between the interview and your review, I will start reading The Falls just as soon as I can. And I’ll take your advice to start at the beginning with THE FALLS: IN THE DEAD OF WINTER. I do have a question for Mr. Jackson: Where in New Mexico were you a teacher/principle? It looks like a really fun series. Thank you! I hope you try it! The town is very welcoming…and a bit quirky! This sounds like a very interesting series, one I would love to get addicted to. Thank you Carolyn! The folks at The Falls are waiting to welcome you! Wonderful interview and the book sounds great. I love New England mysteries. Love the Dragon Man, George Jackson. Great interview, Kate! Wonderful interview, Kate! I thoroughly enjoyed ‘meeting’ you, George. And now, I absolutely HAVE to read your books! Looks like a very interesting series. Would love to read any of them. Dear George . . .started reading your first book today (been meaning to for a while, but a bit busy as you know! )–loved the Murder She Wrote series and share favorite TV shows too–all of my favorite authors write seamlessly and beautifully, enveloping the reader in the story effortlessly and then every once in a while there is a sentence or a paragraph that demands re-reading for the sheer beauty of the words and thoughts expressed. I hit one (or more accurately it hit me) of those paragraphs today. Looking forward to hitting a few more on my journey through West Sugar Shack Falls.